How to Import CSV File Into SQL Server Using Bulk Insert in SQLServer? Imports a data file into a database table or view in a user-specified format in SQL Server 2008 R2. Use this statement to efficiently transfer data between SQL Server and heterogeneous data sources. Is the database name in which the specified table or view resides. If not specified, this is the current database. Is the name of the table or view schema. schema_name is optional if the default schema for the user performing the bulk-import operation is schema of the specified table or view. Is the full path of the data file that contains data to import into the specified table or view. BULK INSERT can import data from a disk (including network, floppy disk, hard disk, and so on). Specifies that all constraints on the target table or view must be checked during the bulk-import operation. Here we are going to show how to import csv files data into a SQL Server table using bulk Insert method. 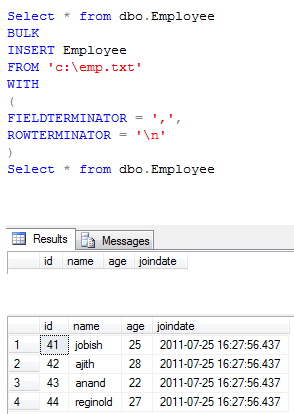 First of all create a csv file with data as follows :- id, name, age, joindate (Should be same as structure of table). We have a table with same structure of columns : id, name, age , joindate. How to implement collapsible panel extender in ASP.Net/C#? Here we are going to demonstrate step by step process to implement ajax collapsible panel extender in ASP.Net/C#. In order to implement collapsible panel extender we need to include ajax control toolkit dll as reference to our visual studio. Collapsed="true" TextLabelID="lblText" CollapsedText="Click to Show Content.."
How we can implement ajax collapsible panel extender from code behind in ASP.Net/C#? In some scenario we have to create and implement a ajax collapsible panel extender dynamically as per the data from the database in ASP.Net/C#. We can create and implement ajax collapsible panel extender dynamically from code behind in ASP.Net/C# using below mentioned code. Below mentioned example of setTimeout() in Jvascript will start count down after click the button up to the seconds that we enterd into the text box. It is very simple sample for setTimout(0 in javasscript can be easily understood by beginners also. In meta tage we can set time of interval and have to also mention url that we have to load with the time of interval. By using Reflection class we can access all types of objects in a dll file. Now we are going to demonstrate how we can access all list of classes and methods by browsing a dll file. We can also run a particular method from the dll by passing proper parameters. We are using Reflection class to accept all types from a dll file in ASP.Net, C#. The System.Reflection namespace contains classes and interfaces that provide a managed view of loaded types, methods, and fields, with the ability to dynamically create and invoke types. What is Reflection in ASP.Net/C#? Reflection is a collection of classes which allow you to query assembly (classes/objects) metadata at runtime. Using reflection you can also create new types and their instances at runtime and invoke methods on these new type instances. Reflection enables you to find out information about types in your assemblies during runtime. Using reflection, you can find out the details of an object’s methods in terms of its access modifier ( private, public etc. ), you can discover the name and types of parameters in a methods signature. Reflection is the ability to read metadata at runtime. Using reflection, it is possible to uncover the methods, properties, and events of a type, and to invoke them dynamically. Reflection also allows us to create new types at runtime. How to List all classes in a dll file using Asp.Net,C# using reflection? The following function accept dll file and extracting dll file using reflection class and return all classes in the dll file. We can call this function by dll file path as parameter then it will return all classes in the dll. In our project we are using a openfiledialog control to browse dll file and once the user select the dll file from local folder it will call below mentioned function with parameter as dll path. Then it will return all classes in the dll file and we are displaying this list of class names in a list so that user can clearly seen all classes in the dll. Next we are going to access all methods in a class in the dll file. Here we have to pass dll file patha and class name to list all methods. The output will be the list of all methods in the particular class in the dll file. Is it possible to run a method in the dll file at run time in ASP.Net,C# using reflection ? Yes, we can run a particular method in a dll file from our ASP.Net/C# application using reflection library at run time. Let’s see how we can run a method in the assembly file. The below mentioned function demonstrates how we can run a particular method from the asp.net,c# application at run time. /// Runs target Method from target Class from target DLL. // Create the assemblies from our current DLL. // Get the type that we want from the assemblies. //  Example: "Reflectionism.Examples.Example1" or "Reflectionism.Examples.Example2"
// Get the desired method we want from the target type. // The first parameter to pass into the Invoke Method coming up. // This calls the target method ("DisplayMyself"). //  NOTE: I'm not passing any arguments down to the method being invoked. Hence we have discussed all possibilities regarding reflection in asp.net/c# such as how to access types/classes from dll file, how to get/access methods/functions from dll file/assembly using reflection in asp.net, possible way to call/run a method/function in the dll from asp.net/c# at run time. We hope you got a needful help from this post. Thanks..
window.location.host = " myexample.com "
Whenever we want to get querystring values from website URL we can call above function and which returns a object that holds all website URL parameters of the current page as key value pairs.